The latest edition of the Yodelar Investor magazine is now available to all subscribers. As we move into the new year, we look back on the winners and losers in 2018. We list the best and worst performing fund managers and identify the funds that have excelled as well as highlight the funds that have been among the worst. Also included in this edition are detailed performance reviews for fund managers Columbia Threadneedle, Quilter Investors and Merian Global Investors, as well as our latest fund manager league table, top funds report and model portfolios. Log in now to access. Not subscribed? Join now for just £1. Access this edition plus all premium features of Yodelar. Subscribe today for £1. 2018 has been a difficult year for fund managers as numerous political and economic challenges have resulted in many investment markets experiencing high volatility and a decline in growth compared to previous years. With this in mind, we look back on the performance of more than 100 fund management firms and rate each based on the proportion of funds under their management that have done better than their competitors in 2018. In this report, we feature 5 fund managers whose funds have continued to excel in 2018, and we also identify 5 fund managers whose funds have been among the worst performers on the market. The return of volatility in 2018 following mostly calm conditions dampened returns available to investors as a difficult year culminated in just 11 of the 36 Investment Association sectors achieving gains. However, despite the conditions, a proportion of funds have continued to excel and enjoyed a stellar 2018. To identify these funds we completed a performance analysis of more than 3,000 unit trust & OEIC funds, and in this report, we list the 5 best performing funds of 2018. These funds range from various sectors and have returned high levels of growth even though a large proportion of their peers sustained losses. We also identify 5 funds that have been among the worst in 2018. These 5 funds have each sustained sizeable losses over the past year as they ranked at the very bottom of their sectors. There are 95 fund management firms who manage 2,301 sector classified unit trust and OEIC funds. These funds combined manage over £1 trillion of investor assets. Like any industry, some of these fund managers are top performing, and some are poor performing. With such a large selection of popular investment brands entrusted with our money, how can we tell which ones perform the best? For our league table, we carried out an extensive performance analysis of the unit trust & OEIC funds that are managed by 95 Investment management firms. Each fund manager has been ranked based on the percentage of funds they manage that have received a 4 or 5-star Yodelar performance rating. When established in 1994, Threadneedle started in the UK Insurance industry but quickly innovated and moved into asset management where it became a well-known brand in the UK and Europe. In 2015, Threadneedle then merged with their sister company Columbia, who was a widely recognised brand in the US. This merger made them one of the world’s largest asset managers with £372 billion of combined assets under their control. As a Global fund management giant with more than 450 investment professionals across the world, they command sizeable influence with investors and advisers. But despite their size and Global presence are their funds competitive or are their better-performing alternatives available? In March 2018, Old Mutual announced its plans to make certain changes to the group. One fundamental change was to gradually move away from the name ‘Old Mutual’ and replace with ‘Quilter’. The first of their brands to adopt this new name was their multi-asset business, Old Mutual Investment Management Limited, which on 29th June 2018 renamed and rebranded to Quilter Investors Limited. As a result of these changes, the names of their multi-asset funds changed. However, there was no change to the funds’ risk profiles, the cost of investing or the fund manager. In this report, we analysed the recent 1, 3 & 5-year performance and sector ranking for 72 funds that are now managed by Quilter Investors. These funds hold a combined total of £19 billion of client assets, but as identified in this report, more than half of these funds have consistently been among the worst performers in their respective sectors. Although Merian is a new company, who are building for the future the funds they now manage have been long established and combined they hold almost £30 billion of client money. Find out the average growth returned by each investment sector over different time periods and discover which sectors have returned the highest average growth. Find out which investment sectors have been the most popular among UK investors, and which sectors have proven the most popular with investors and which sectors investors have been moving their money out of. Find out which investment sectors and asset classes have been the most popular among UK investors over the past 13 months. Access the latest top fund reports which identifies the performance, sector ranking and overall rating of all 3,000 plus unit trust & OEIC funds available to UK investors. 6 model top performing portfolios. See the growth returned by our 6 top performing model portfolios comprised of consistently top performing funds which follows the asset allocation model highlighted by consumer watchdog ‘Which?’. 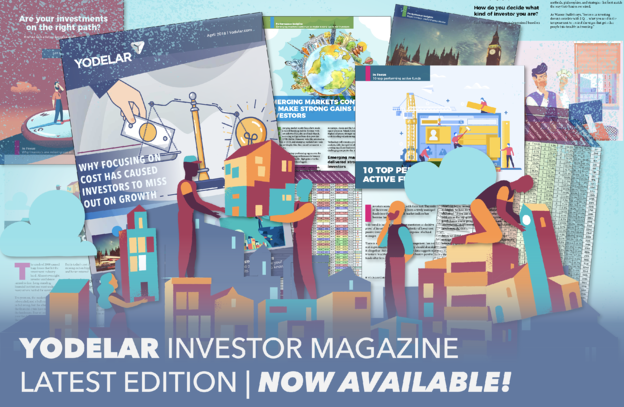 Log in now to view the latest Yodelar Investor Magazine.